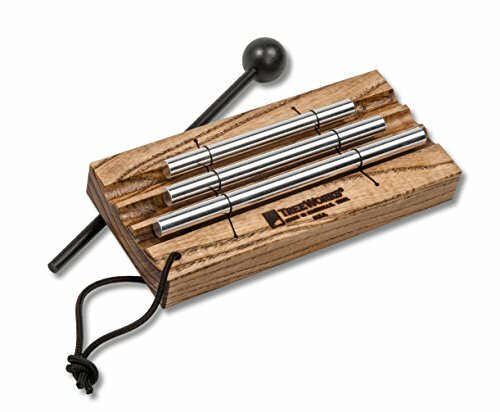 THE PERFECT TOOL FOR MEDITATION AND THE CLASSROOM | With just a strike of the mallet, the TreeWorks Chimes Three Tone Energy Chime produces three brilliant and lasting tones that fill the room. Use one tone as a way to recenter yourself or play with all three tones to signify different checkpoints in your classroom throughout the day. No matter how you use it, you'll be surrounded by three crystal clear tones that put you at ease all day long. COMPACT, VERSATILE, AND DURABLE | Long-lasting braided CordLoc is used to susped our 3/8" thick Aluminum/Titatnium alloy bars on a hand-finished hardwood mantle. Each Three Tone Energy Chime is fitted with a super-durable braided nylon cord handle for hanging. DIMENSIONS | The TRE420 is 12 x 1.5 x 8 inches in dimension and comes with one 8" birch dowel hard polymer mallet for playing.